Payton College Prep remains the cream of the crop where Chicago Public Schools' selective-enrollment high schools are concerned. 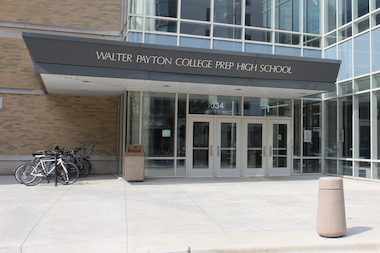 NEAR NORTH — Walter Payton College Prep remains the toughest of Chicago Public Schools' 11 selective-enrollment high schools to get into, according to cutoff-score data released by the district. On a 900-point scale for admission next fall, the lowest score to get into Payton outright was 896, meaning that being docked five points ruled out applicants unless they gained entry on one of the tiers the district uses to allocate spots based on socio-economic issues. The scores are based on grades, standardized test scores taken during seventh grade and a high school admissions test. Northside College Prep had the next-highest minimum score for nontier applicants, 891, and Jones College Prep had a minimum of 886. While those scores represented what was needed for the top applicants, 70 percent of seats are assigned based on where your live. Those applicants are tracked by census tract on one of four tiers, based on the area's median family income and average education level, as well as the percentage of single families, English speakers and homes occupied by homeowners, with Tier 1 being the neediest and Tier 4 the least needy. At Payton, slots allotted to Tier 1 applicants went as low as 769, although Tier 4 applicants had to post an 890. Other schools had similar breakdowns, but for nontier applicants, cutoff scores were 874 at Whitney Young and 851 for Lane Tech, the two largest selective-enrollment high schools, followed by Hancock at 784, Brooks at 775, Lindblom at 754, Westinghouse at 748, South Shore at 676 and King at 672. Students are expected to get their acceptance letters by Friday and must accept or decline by a week later, March 11. The district was still working on compiling overall data on Monday, but last year 13,413 students applied for 3,600 seats at selective-enrollment schools.